You want your Goldendoodle to be strong, healthy and full of life. That’s why you need to ensure that it has the best diet available. There are some excellent mass market and boutique dog foods on the market, made with all the ingredients required for healthy dogs. You can find that info on numerous dog wellness websites so we’ll let them do what they do best. In this blog post, we’re going to look at other ways you can impact (for better and for worse) your Goldendoodle’s diet at home. Now you know you can surprise your Goldendoodle every now and then by adding some human food to its diet. Just be careful how you present the food to avoid creating bad habits like begging. Top 12 Foods Your Dog Should Never Eat! Well, it all depends what it is and what’s in it. Surprisingly, there’s a lot of people food your dog should NEVER eat. Some foods in particular are super dangerous for dogs, we’ve compiled a list of the top 12 most dangerous foods and some may surprise you! I don’t have kids, but my Goldendoodle Jake may as well be my child. Though I’m not one of those crazy dog moms that indulges him, I keep it real, and he lives a happy, simple life– enjoying long walks, outings, and time hanging out with the family. But a while ago, my friend and I got into a heated discussion about dog food, something that I’ve never really thought twice about. She asked me if I’ve ever read the ingredients on the back of Jake’s dog food. Not really, I told her. But didn’t “premium” kibble mean premium ingredients? As we’ve noted, diet is critical to raising a healthy Goldendoodle. But the fact is wellness doesn’t start there. You need to acquire your canine best friend from a conscientious breeder who guarantees the perfect health of their breeding pairs and puppies. If you’re looking for a health-guaranteed Goldendoodle of the highest quality, Blue Ridge Goldendoodles is the place to go. Nearly two decades of producing second-to-none puppies has earned us a sterling reputation. You are certain to get the best when you secure your new best friend from Blue Ridge Goldendoodles. If you have questions about our pups, breeding methods or purchase terms, call us at 865-286-5338 or fill out the contact form on our website, and we will get back to you. Thinking About a Dog? 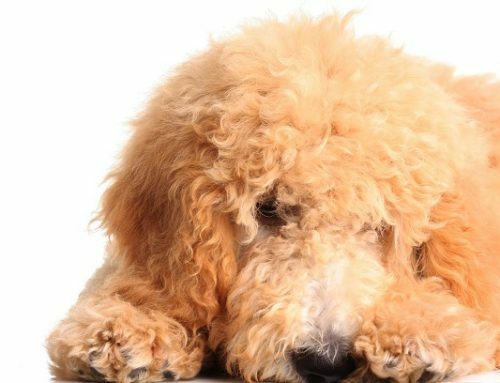 Is a Goldendoodle Right For You?